Ethereum, the decentralized app network and cryptocurrency rival to bitcoin, has continued to climb after last week’s sudden market pump, overtaking Ripple’s XRP digital token to reclaim the number two spot in the list of the world’s largest cryptocurrencies by market capitalization. 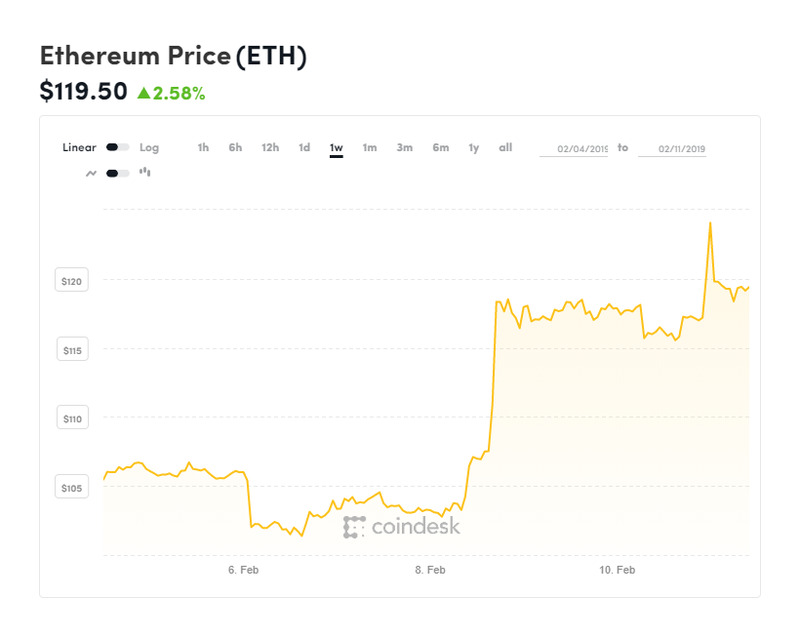 The ethereum price has surged some 3% over the last 24 hour period to over $120 per ether token, according to the latest CoinMarketCap prices, as ripple (XRP) remains flat and the wider market holds onto its gains from late last week. Bitcoin, currently trading at around $3,600, is up some 5% over the last week after a relatively minor bull run sparked by news of a litecoin network upgrade. Ethereum’s price uptick amid a largely flat market appears to be down to some major moves from large ethereum holders, as shown by a cryptocurrency whale tracker. Ethereum now has a market capitalization of over $12.6 billion, slightly above Ripple’s XRP $12.5 billion market cap. Litecoin, which powered to fourth place in the list of largest cryptocurrencies last week, has a market cap of $2.6 billion. Many expect that the next real bitcoin and cryptocurrency bull run, taking the price back to the highs seen in late 2017 and early 2018, won’t come until use of cryptocurrencies improves throughout the wider population. Ripple, also the name of the company that holds some 60% of ripple tokens and maintains the ripple network, has added a number of new partners in recent months and has teased a potential tie-up with institutional rival Swift.